The sensational TV coverage continues. For some reason, I found something really sad in the pictures today of 40 tonelados of marijuana, and more guns than I could count. It was as if the dirty interior of Rio was exposed, just this squalid stash. It made me feel sad, because the worth of it was incalculable, especially when you include all the stolen bikes and cars the police found (do you like the way I’m not including any facts or numbers here?). But when you look at pictures of the place, and the poverty that people have been living in, nothing (other than the ostentatious homes of the traficantes) is of any value at all. I wonder what will bring any currency into the place now that its only source of wealth has been removed. It’s not the most obvious image to be moved by, but for some reason other than heat-induced fatigue, it did make me feel quite sad. In the same way that when someone dies, and you look at all their accumulated posessions, you wonder if that is all that a life amounts to. Of course a life amounts to a lot more than possessions – perhaps really the opposite of this – but they tell a story about how that person lived. With the glamour of power removed, it amounts to monotony, fear and squalor, and that makes me sad. That’s a kind of mantra in some of the lawless places here, which basically means “who has the power commands, and you must obey their judgements.” That’s a bad translation but it sounds really ominous in Portuguese and I can’t get that across in English. Things are calmer on the streets, with the army and the police now occupying some of the biggest favelas here. Even then, they are worried it might all have been too simple and there are traps lying in wait. The TV coverage is sensational. Everything the police get access to we seem to get access to as well, so that we got to see the arrest of the traficante Elizeu Felício de Souza, with a bizarre scene on TV where he was stood with his back against a car, almost patiently being filmed, accepting that TV coverage was part of the arrest experience. I’m not sure contempt of court is a big issue here. Now they are having to sort out things like the electricity supply and mountains of litter in the Complexo de Alemao. Some of it is public services which have been absent in the previous week due to the trouble, some are services which have never existed there. That seems essential since if you’re going to go into a community and shoot some of the people you probably need to improve their lives in some way. Permanently, the army and the elite squad can’t stay there, so the government will have to start providing the structure that previously the criminals had done. It’s still quiet on the streets, and not many people were out in Santa Teresa last night which is usually the busiest night. I finally had fejoada in Mineiro which never happened before as I couldn’t get near it, it’s always so busy there. Most people are afraid, but they are also aware that nothing like this has really happened before. A previous attempt by the police to invade favelas ended in their retreat, and friends told me last night the violence escalated then so that cars were set on fire with people still actually in them. I get the feeling the police are still pretty angry that a helicopter was shot down over Alemao in October last year as well. I’m not sure how much trust people have in the authorities, but I really hope the end result is an improvement in the lives of ordinary people living there. Not just having to obey those people who have guns and violence at their disposal. 30 more people dead today, so I heard earlier on the TV, with tanks and the military going into favelas in the north making that figure almost certainly out of date. Restaurants where I live closed, and even the little woman I buy cakes from closed up shop over an hour ago (it’s about 8pm now). People are frightened. It seems what I was told about the bandidos starting a war if the UPP came to their favelas was true. 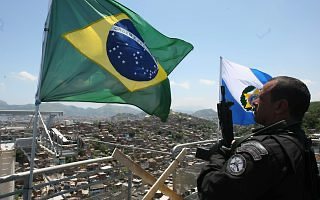 I remember the pictures of kids playing on a BOPE tank in O Globo, as if to suggest everyone there welcomed the cops and it was just one big happy family. Not quite like that now. Some people on Twitter are posting that they no longer trust the police operations since seeing Tropa da Elite 2, which shows a great deal of detail about police corruption. For the time being, I’m just staying indoors and waiting for it to pass. Symbolically perhaps, a storm has also started, making the sounds of shots indistiguishable from the sound of thunder. Those are daunting words as I can’t see the criminals going down without a fight. It is a war, but it’s a bit like the war on drugs, in that it appears there are many in charge who would benefit more if the status quo continues. In other news, I have solved the motivation problem; coffee is what you need. I gave up tea upon arrival, along with lots of other things I knew I had no hope of getting and would have to swap for Brazilian foodstuffs instead. Being as I used to survive through a day with about eight cups of tea, it’s a good job the stuff I’m drinking now is extra forte! I just down a few cups of the stuff and the emails and phonecalls start flying. I have realised that it can be a lonely life freelancing, so some sort of rocket fuel is necessary to provoke action. My least favourite aspect of working in an office was always the politics. I don’t know if it’s similar in other lines of work (I suspect it is), but in the media it is almost a badge of honour that you took unneccessary grief in your career. It reminds me of those people who are ruthlessly beaten and bullied at school, and then go on to say “It made me who I am today” and mete out the same punishment to others. I never quite know if it’s something I should have continued to tolerate or if the smart move was to get out and probably live a longer and happier life. Unless I get shot. Actually, scrap that, I’ll take my chances here with the bandidos. Off to surf again on Sat, as I’m desperate to master it. The hardest thing is being carried along by a rip current and having to constantly get out of the ocean, carrying your heavy board, and plunge back in again. I think if I was physically stronger it would be a lot easier. I have a few bruises too, but it is addictive. Each time a new wave comes, you just get taken over by the urge to conquer it. I sincerely hope my doing so coincides with the time I get a new USB port – and I can show photographic evidence. I realised yesterday I was getting impatient at tourists who couldn’t use the Metro. it’s unfair of me, but on the other hand it means I must feel at home now. Summer has really arrived, which means not just heat, but cloud and humidity which quickly turns to rain, which then evaporates in the heat, ad infinitum. I’ve found myself looking at clothes in luminous pink, majenta, turquoise. It all looks different in the glowing sun, as I never liked those colours when I was in England and milky white. I’ve given up trying to run on the beach, and now surfing lessons have taken the place of jogging. At least the Atlantic Ocean is always relatively cool. Having to motivate myself is the biggest problem which has replaced the problems associated with working with people. Anyone I do work with is under no obligation to help me either. I can’t count how long I’ve been trying to write the same story, but somehow never manage to arrange to meet the person I need to interview. Of course, people in offices aren’t more likely to help, but at least if you work for the same company there is a chance. The past few days, the place has been crawling with police. It;s thanks to a new wave of arrestoes, teh term for when a huge gang of criminals invades an area and causes mayhem, stealing and assaulting people. Yesterday, two people were killed when their cars were attacked. Now it seems to have launched a mass panic, with the Mayor Serge Cabral on telly and a bunch of officials meeting today to decide what to do. Even then, as I waited to get my motortaxi up the hill last night, a mode of transport which is technically illegal, a convoy of police cars were waiting at the bottom – and did nothing to stop the motortaxis carrying on with their work. I suppose they weren’t attacking and shooting people, but even so. For the first time since I’ve been here, I’ve been up early enough to see the sunrise, which didn’t disappoint. Going to see a really interesting project on Friday; if this and a few other things come off, I’ll be comfortable enough to finally get that USB port sorted and start posting pictures here again. This always seems appropriate here. I went out to Leblon last night with a couple of entertaining ladies, one of whom is one year older than me (though looks about 25), and the happy recipient of a bout of liposuction. This explains, I thought, why so many women have such improbable bodies here. Her tiny waist and flat stomach belied her 34 years. The excuse usually given for such extreme vanity is that Cariocas have to spent most of the year on the beach. This doesn’t really explain why generally, you’re more likely to see morbidly obese people of both sexes flaunting their bodies in tight clothes than you would in the UK on a sunny day. It’s hard not to take to someone with such a natural gift for humour, and the usual Carioca way of welcoming strangers into the fold that puts my countrymen to shame. But if I wanted to get away from the spoilt behaviour of the young London middle class, it was a case of frying pan and fire when I came here. Many of the better off people I meet have never even travelled on the bus or Metro in their own city. I’m probably just making the same point over and over again, I do realise. The longer I’m here, the more I get used to it, but also the more I hear that makes me think things won’t change. The tales of corrupt cops, politicians, etc, the engrained culture of violence, make it hard to imagine a different and more equal kind of city being possible. Thankfully there are people here who think bigger than I do. It’s quite difficult to seperate them here sometimes. I spent most of yesterday hearing tales about drug lords having plastic surgery so they can never be found by the police, stories about the kept women of the bosses of jogo do bichos (popular, and illegal, gambling game here) and all sorts. The backdrop was Vidigal favela (although I took care to use the word communidade while there). At about 7pm, the result of the election was announced, with the Workers’ Party (PT) candidate Dilma triumphant as expected. A huge cheer erupted from the admittedly already battered crowd below, and Barry White, of all things, boomed out of the stereo as we watched the sun go down over Ipanema and Leblon, with the orange lights of the Lagoa beyond. Dilma’s party is popular with the poorer voters. Nearly all my students, with the exception of a couple of liberal lefties, wanted Serra, the former governor of Sao Paulo who is slightly more to the right. Under PT, the economy has been more stable (helped by the discovery of oil) but lots of people told me they’ve voted for Dilma because she’s from Lula’s party, not for her own sake. Although it’s clearly momentous that Brazil has elected a female president, the pullout in O Globo today has a picture of Dilma with her eyes cast down on the cover, with the warning words that she still has a lot to sort out – namely sanitation, infrastructure, health and education for starters. Not an enviable task ahead by any means – and all with the knowledge that Lula will almost certainly want to run for office again when he’s permitted to, in 2014.